During the summer months many loggerhead sea turtles come ashore on Sanibel and Captiva to lay their eggs. Adults can weigh well over 200 pounds. 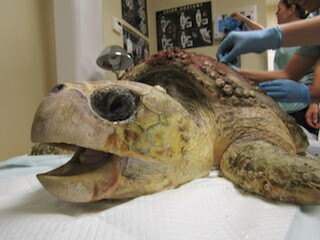 This loggerhead sea turtle was found floating and very debilitated. When it arrived it had large amounts of epibiota (barnacles, algae and other small organisms) on its shell. 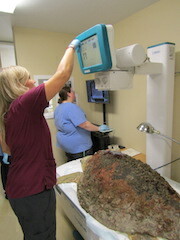 A diagnostic exam was given to the turtle this morning to help determine the cause for its debilitated state. Blood samples were taken to send out for testing for brevitoxicosis, or red tide poisoning. Results can take up to three weeks to be returned. 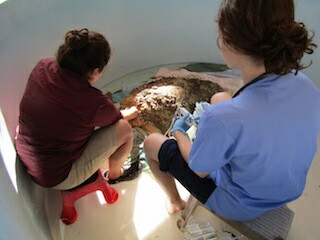 The loggerhead was administered fluids this morning by the veterinary team. 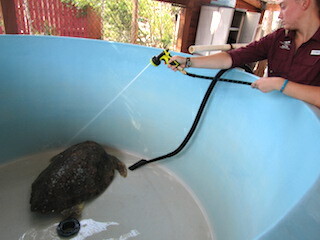 After it received fluids, the tank was filled with fresh water which will help to rid the turtle's shell of the epibiota. Once the tank was filled, the turtle began swimming around and was offered squid and fish which it readily devoured. Over the weekend, the loggerhead turtle has continued to have a great appetite. It is swimming and submerging in the tank. Over the weekend, the loggerhead continues to eat well and make regular bowel movements. It was also dewormed over the weekend. 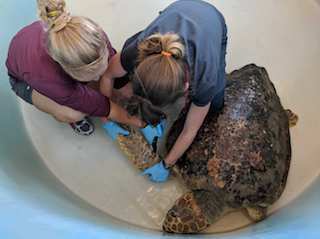 Test results for brevitoxicosis, or red tide, which came back last week showed the loggerhead turtle had very high levels of the toxin in its body. It continues to do well in rehab and veterinarians are waiting for its iron levels to return within normal limits before release is considered. 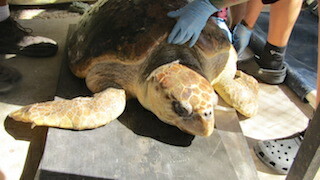 The loggerhead was tagged recently with flipper tags and a passive integrated transponder (PIT) tag. It's release back to the ocean is pending the results of final blood sample tests. 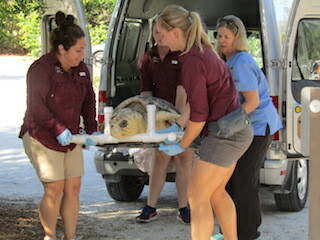 The turtle was weighed this morning as part of its assessment for release. It has received a clean bill of health and is cleared for release pending approval of a time and location. 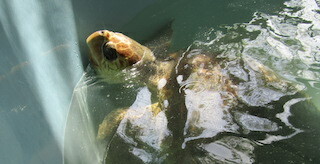 The female loggerhead was released this morning at the Sanibel Lighthouse Beach.